The ARTbar Studio/ARTstarters - Pumpkin Party: Zentangle, Painting & Decoupage! 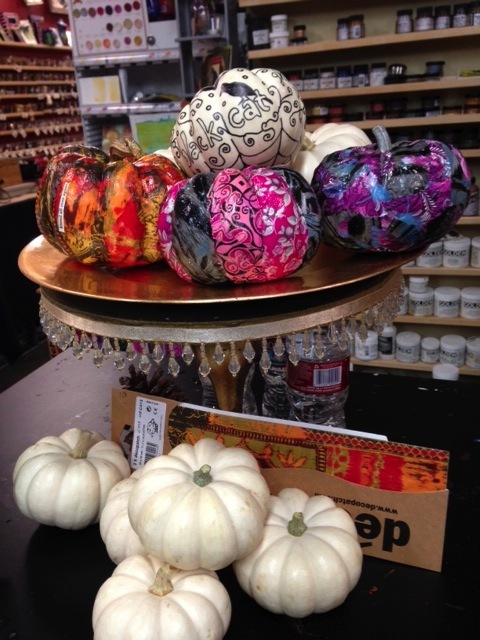 Pumpkin Party: Zentangle, Painting & Decoupage! Zentangle it, Paint it or Decoupage it! We can provide a pumpkin for you* OR bring your own pumpkin (small ones work best for decoupage and medium to large for painting). We have an idea book or visit here for painting ideas. * Our favorites are the mini-white pumpkins. We bought a case load from Growers Direct (Costa Mesa and Aliso Viejo). We found these to be the best for our French decoupage papers. Not too big so they last for many, many months. Plus the white color doesn't show under the designs of the thin papers. Paint, pens, glues and paper scraps included. Learn some new Zentangle patterns and get ideas from other artists.